Zombie Math Teacher: Advanced Graph Art for Grades 6-8 & Student Edition now available! Advanced Graph Art for Grades 6-8 & Student Edition now available! Happy Fall everyone! I hope your back-to-school prep has been rejuvenating and not to stressful. I have been slowly transitioning into my new role as a tech integration coordinator all summer, which is bittersweet, but also really exciting. In addition to work changes, we also successfully resurfaced and repainted the deck, and redecorated two bathrooms. Summer went by in the blink of an eye, as usual. Good news for you all, as you head back to your classroom, is that you have a glut of new fun math activities available in my new book! The first edition contained 25 puzzles to walk your students through the basics, with a taste of transformation challenge. 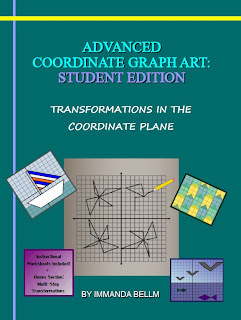 The new second edition (click either picture above) will take your students' skills to a much higher level of understanding in the area of coordinate plane geometry. Stay tuned for updates. I will post as soon as I can with more info about the new TpT listings and when Amazon.com is up to purchase. Enjoy your first few weeks back!